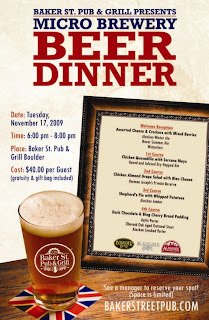 Thanks to everyone who expressed interest in attending the Baker Street Pub & Grill Beer Dinner set for tomorrow, November 17th at 6pm to 8pm at 1729 28th Street, Boulder, Colorado. I received around 35 valid entries for this event. Many of the contestants completed multiple criteria and qualified for additional entries into this contest. All entries names were put into a hat and one entry was drawn with the names of the 2 people who would win this competition. I am happy to announce that Emily Baskin (winner) & Erin O'Brien (her guest) were selected as the winner of this event. An email has been sent to the winner notifying them of their win and instructions on how to claim their prize. The winner will receive complimentary passes to the 4-course meal sponsored by the Baker Street Pub & Grill, Alaskan Brewing Company, Boulder Beer Company and the AC Golden Brewing Company. The meal will include a welcome reception featuring beers from all three breweries, a complete 4-course meal paired with a selection of fine beer as well as a complimentary gift bag following the dinner. For those of you who do not win, there are still seats available for this dinner. Plus - if you ask for the "ChipperDave" discount you'll get $10 off the cost of the beer dinner! Reservations are suggested. You can contact the Baker Street Pub & Grill at (720) 974-9490 or talk with a host at the restaurant. The normal cost is $40 per person (includes gratuity and gift bag), but get $10 off if you mention the ChipperDave discount. - Boulder Beer offers Flashback 30th Anniversary Ale.